Speak to our friendly customer care assistants to receive an estimate for interior and exterior window cleaning now. Dial 020 3746 1366 or fill up the contact form. Consider choosing the services of our roof cleaners and receive appropriate, excellent quality workplace or house roof cleaning. The cleaners apply jet washing gear to rip out mildew, algae, mould from roofs. All our services are completely covered with insurance. You will enhance the look of your property and will shield your roof from any harm that may grow due to debris and other residues built up on it. The cleaners will use only water, and eco-friendly and completely safe cleaning solutions. Make sure that your windows are clean, and that your gutters and roof are free of debris - request our professional window cleaning service now! Owners of private and business properties in the area know that regular and proper gutter cleaning can save them the need for repairs and a lot of problems in case water damage occurs because of clogged gutters. Ashlee House Cleaning will help get your gutters clean safely and efficiently, at an good price. Our gutter cleaners use professional powerful vacuum cleaner connected to telescopic pipes to reach your downpipes and gutters and clean them without a ladder. These pipes have cameras, so that all dirt and debris is visible. We can provide you with before and after pictures of your gutters. This service has a quality guarantee of 30 days. In case your gutters get clogged during that time we will clean them once again. Order top-quality window cleaning in Willesden NW10 today! To help to make the booking method as swift and easy as possible, we have implemented a great 24/7 system. You simply just need to get in touch with us by either calling 020 3746 1366 or making use of our online contact form. You can ask for a totally free quote or directly book our window cleaning Willesden NW10 service right now. Our expert window cleaners will arrive on any day of the year. We have bank holiday and weekend availability. We have fair prices, no covered fees, and no downpayment for booking. 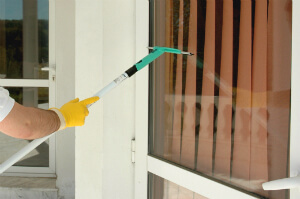 We will offer you a discount for each other service you order along with the window cleaning. Property managers and property agencies get cheaper fees as well. Take advantage of our environmentally friendly, professional and inexpensive cleaning services and make a booking right away. You will be sent an e-mail affirmation in the next two hours!